The perfect storage solution to accompany your bed. You can match your underbed storage to suit your bedroom decor. If you are looking for an easier way to store your unwanted clutter then our underbed storage boxes are the ideal solution. Designed to be stylish and convenient, our storage boxes are handmade from our high-quality pine. 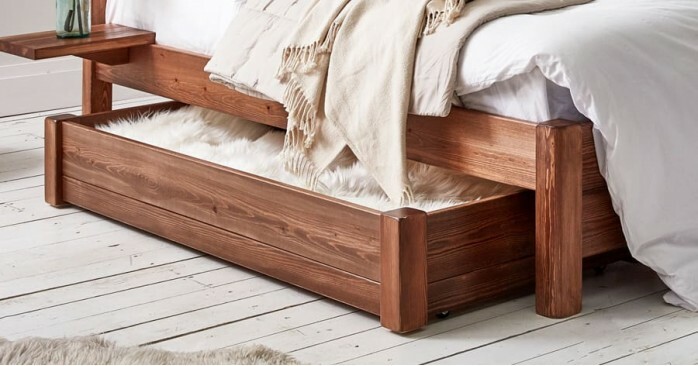 As with our bed frames, our handmade wooden underbed storage boxes can be customised to suit your decor, and if you already own a wooden bed from Get Laid Beds, then we can make your storage boxes in exactly the same colour as your bed. Underbed storage boxes are sized to fit underneath any of our standard height bed frames and four poster beds. The boxes are available in 3 sizes, our ½ underbed storage box, ¾ box and the larger full-length storage box. Single beds allow for 2 of our ½ storage boxes, or 1 ¾ box, whilst double beds and above allow for 4 or more ½ storage boxes.